Switch, which operates the massive SUPERNAP data center complex in Las Vegas, unveiled plans for its most advanced building yet. The SUPERNAP 8 data center will be built with two independent, separate and individually rated 200 mph steel roof decks. The two roofs are located nine feet apart and are attached to the concrete and steel shell of the facility and contain zero roof penetrations. The new facility will use the Switch IRON BLACK FOREST temperature control system for heat containment and to mitigate an disaster event impacts. The building will also feature a patent pending flywheel to support refrigeration and temperature controls during a power outage by delivering uninterruptable high-efficiency data center cooling. In addition, SUPERNAP 8 will offer the same tri-redundant backup power systems and the enhanced security that Switch uses in its other building. Switch notes that its Las Vegas location is extremely well connected by national fiber. It is also located in "the safest desert on the planet, free from natural disasters and disturbances and built on the newest and greenest power grid in the United States." Last Fall, Switch, which operates the massive 407,000 square foot (37,800 m2) SuperNAP data center in Las Vegas, announced record-breaking sales for the month of September. Switch sold 533 cabinets of space and 7.6 MVA of power over a 30-day time period. There were 40 new clients. This will serve to bring the SuperNAP up to 84% occupancy. Switch provides colocation, connectivity, and cloud services for national and multi-national companies, government agencies and other organizations. During the last year, Switch said it has delivered 40 MVA to its clients at the Switch SuperNAP-7 facility. This facility has 84 MVA of UPS and over 10 million CFM/tons of cooling available to deliver to its clients. "No other data center on earth can match it," said Missy Young, EVP of sales. "These numbers should end the debate on what facility is the world's largest modular data center." While SuperNAP-7 nears capacity, Switch said its its eighth facility in Las Vegas will be client-ready in May 2013. 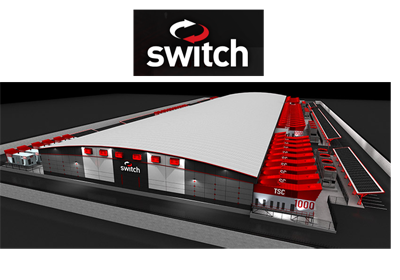 Switch recently announced expansion of the Switch SuperNAP Las Vegas Campus to a total data center space of 2.2 million square feet (204,000m2), making it the largest commercially available and independent technology business ecosystem in the world.